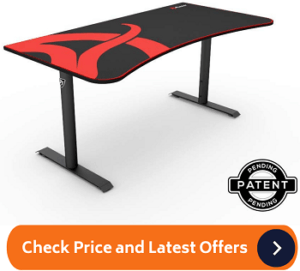 Want to buy a gaming desk for your computer? But You don’t know which one is best for you. You don’t have to be worried anymore. We have reviewed the best gaming desks available in the market and ranked them by keeping every gamer’s needs. It is one of the most fully-loaded on the market with almost every feature you’d ask for. However, it may not be the most durable, but is ideal for any gamer who wants to elevate their gaming experience on a budget. For a quality gaming experience, the Arozzi desk doesn’t disappoint. It is the gold-standard of mid-range gaming desks with its waterproof mousepad mat and offers adequate space for multi-monitor setup and other gaming accessories. The Origami gaming pc desk provides fantastic sturdiness, handling heavy gaming setups with immense portability. This makes it an awesome choice for gamers who are constantly on the move, or love changing things around in their gaming room. If you’re looking for extra storage space for your gaming gear and setup, the Convenience Concepts gaming desk is an ideal choice. 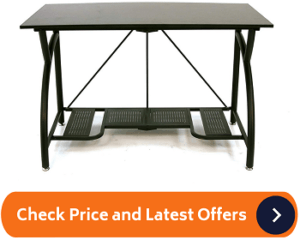 It brings together style and function in an affordable desk, giving a modern touch to any room or space. This desk is designed with gamers in mind so it’s not your ordinary class or office desk. It comes with several unique convenient attachments, which may impact on its appearance, but it’s still simple-looking. This is probably why it’s categorized as a budget gaming pc desk what with its metallic desktop and wireframe design. It supports monitors of up to 27 inches and has nifty places to rest your gaming gear like headphones and speakers. 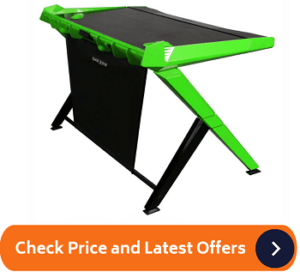 However, it lacks a keyboard tray so it may be uncomfortable for extended gaming sessions. Otherwise, it’s a fantastic choice for gamers who want to spend less on a desk, but keep things tidy and organized. While this desk may not be overly robust and spacious, it is a fantastic and affordable option, providing most features you’d want in a computer gaming desk. This is a plain, wooden gaming desk with several drawers and cabinets to keep your stuff neat and tidy. 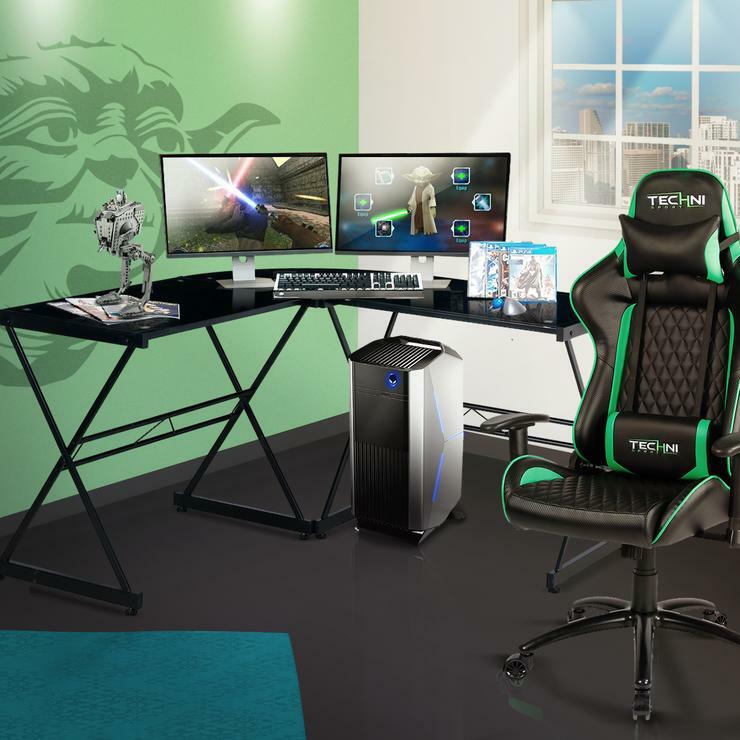 If you have lots of gaming accessories, it would make sense to have this desk, but it may not offer as much space as other gaming desks on the market. However, it is unique, compact, and multi-functional, and lets you use a dual monitor though you’d have to compromise on surface space in this case. It’s also customizable, and provides for your computer tower’s airflow because it isn’t closed at the back. 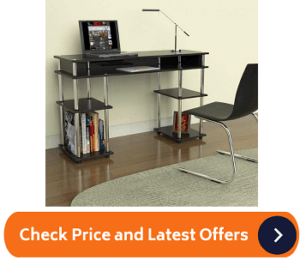 The Techno Mobili is an economy gaming desk owing to its low-cost price. Its compact build makes for easy-gaming while maximizing on your space. When you’re not gaming, you can use it for other things like studies, work, or as a movie center. This option is ideal if you don’t mind spending a little bit more money for an exceptional item. Arozzi Arena gaming desk is a fantastic addition to your gaming room, especially if you have multiple monitors, or you’re into audio-mixing and streaming. It offers plenty of space, with standard shades like black, or stylish but flashy colors. This desk is built with simplicity and versatility in mind, targeting gamers with its sturdy microfiber mousepad and other cool features. Although the Arozzi Arena desk has no storage space or motor, it makes up for this with its multi-monitor setup, ensuring a quality gaming experience. It’s the gold-standard of mid-range gaming desks, so you can get it if you have the space to accommodate it and are willing to pony up for it. This desk is a combo of simplicity built with the PC gamer in mind. If you love gaming but want relief from Carpal Tunnel symptoms, the DX Racer desk is a good option as it’s designed in such a way as to reduce such discomfort. The desk also ensures your precious electronics don’t slide off the back in case your desk is bumped, or you get so immersed in the game and shift things around. It also provides for good cable management, keeping everything neat and organized, while still looking sleek. Although some of its flashier colors may be a tad bit too much for your space, the DX Racer desk offers a cool design that’s built to be strong and durable throughout. As our round up winner, EVODesk, which is used by top brands like Dreamworks and AirBnB, boasts a long list of unique features you cannot find with other brands. With over 8,000 gaming desk options available in the EVO range, this innovative high-end desk is simple and classy, but built for gaming. Like the Arozzi Arena desk, the EVODesk offers good cable management, with adjustable height and mousepad material on its surface. 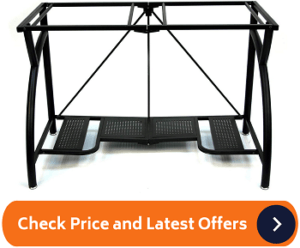 Despite its hefty price tag, the EVODesk allows you to stand comfortably while gaming. It also performs all its functions well. If you’re an ergonomics enthusiast, you’ll enjoy the flexibility the EVO offers for serious gaming. Unlike most gaming desk options, the Prepac desk is mounted or installed to the wall. It has been dubbed the “floating desk”, a unique design that looks great on any space once finished, much like a mounted flat screen. It’s a great option if you want to save on space as it has shelves on either side of its unit, with removable pieces of wood that allow you to enlarge the shelves and add speakers to enhance your gaming experience. However, it lacks a retractable keyboard tray plus it is small in size so PC tower users may not benefit much from it. That said, Prepac is affordable, stylish, and great for gamers looking for aesthetics on a budget. Despite its time-consuming assembly, the Prepac “floating” desk saves on floor space while keeping everything organized and tidy. It also offers lots of storage space for your gaming accessories. While gaming seems a solitary hobby, there are occasions when you need to quickly set up a portable desk, and that’s where it comes in handy. It is wallet-friendly, compact, and surprisingly powerful. 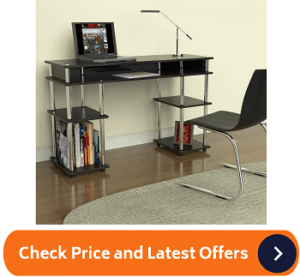 If you move frequently, or tend to move things around the room, this is an ideal desk for you. A dual-purpose desk, the Origami is easy to fold flat for travel and easy storage, and you don’t need any tools to assemble it making it a hassle-free gaming desk option. If you don’t like assembling things, this desk is easy to set up in a few minutes right out of the box. 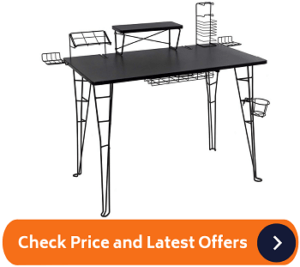 Similarly, if you love changing things around your room, then this desk is made for you. This portable and compact desk is ideal for small spaces, or on the go. 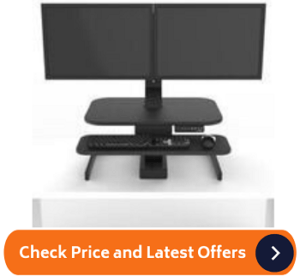 It’s small, but can still fit two decent-size monitors, plus it’s easy to move around and won’t break the bank. Its design is stylish and modern, with a visually appealing black color. The desk is also made with strong and durable, resistance-proof material that can last for years. Added features like the headphone hook and cup holder make for a better gaming experience. It also doubles as a multi-functional workstation, so you get a comfortable gaming and work environment all in one desk. While this desk may be small with little leg room, it is ideal if you have limited space to work with, or you do arena gaming at physical events. After years of gaming, you’ve probably accumulated tons of controllers, peripherals, and cables, so you’ll need a desk that can accommodate and store them all. The Convenience Concepts gaming desk is a solid choice for gamers, which emphasizes storage space. It looks flashy with its wood and metal aesthetic, and makes your disk and book collection look highly refined. What’s more, it doesn’t need any tools to assemble, so it’s a decent offering and low-cost solution. The 50 inches wide open desk has a recessed little shelf underneath the desktop, which doubles the space, and can accommodate an entire PC setup. Style and function meet in this affordable gaming desk. 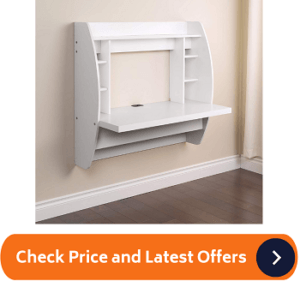 It’s an excellent addition to any space or room, with effortless assembly. For its affordable price and quality, this desk is already a steal. 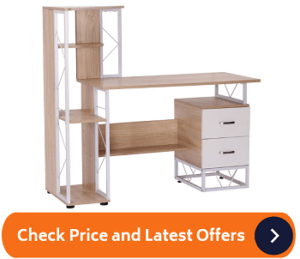 The HomCom workstation has an open design, with shelving and drawers that extend a bit over the lip of the desk. It comes in two color variants: black or white. Its L-shaped design saves on space, and its stylish and sleek design fits well with any office or home décor. 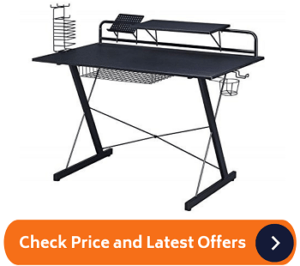 The desk offers massive storage potential with a pull-out keyboard tray that holds your keyboard and mouse, plus space to store your CPU tower in an easy-to-access area under the table. It can also accommodate another laptop, modems, and printer. Although the HomCom workstation isn’t as easy to assemble, its high-quality build, massive storage potential, and durability make it a worthwhile choice for gaming. Some gaming desks have compartments that trap air inside, which causes heating issues. A good desk is open at the back, making for good air flow. Desktop builds most likely have a desktop power cord, two monitor cords, USB and speaker cords. A printer and additional accessories add even more cables to this setup. Besides grommets that help with cable management and cord protection, a good gaming desk offer a rollout area for your keyboard and mouse, allowing USB cords to run from the back. This is good for functional gaming and easy setup. Gamers like to have everything close by so they can play uninterrupted. Some gaming desks offer other tone-deaf features like a place to put a surge protector, onboard cooling or fans for desktop cases, and a cup holder. Additional features like special cabinets, DVD/CD racks, monitor platforms, and sliding keyboard trays for your mouse or keyboard can be handy ensuring your hands and arms are comfy and safe when gaming. Desks are often built with specific use in mind. Some take up a large space, while tiny ones maximize on limited spaces. The gaming desk size matters as you consider how you want to set up your playing area. Some desks even let you adjust height configurations, which is a de facto standard in tech startups. Other desks allow for specific desk arrangement changes as you can convert them to different desk styles to fit certain gaming setups. If you’re a Mini-ATX gamer or have a laptop, check for a desk that’s specifically built with this in mind and can accommodate your Mini-ATX build. 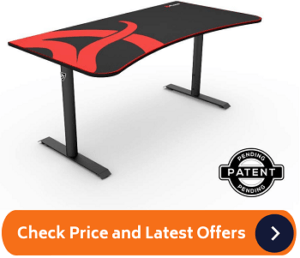 This is the ultimate factor with the greatest impact on the pricing of gaming desks. Most of them are built with materials such as wood, PVC and Steel, or glass. Generally, the best is PVC supported by a solid steel frame as this offers advantages such as high portability and lightweight. Gaming desks made with glass and supported by a steel frame. They look elegant and exemplify modern style, but they can break easily or get damaged more than wood or PVC and Steel. They’re also fingerprint magnets. These are made of maple, oak, or pine as they have rugged physical strength and give your space a traditional look. There are several types available today, each with its own unique design and suitability for different gamer types. The main ones are the standard desks, L-shaped, U-shaped, multi-tier, sitting/standing desks, and foldable desks. Standard desks are popular because they’re affordable and multi-purpose, though they don’t have much in terms of fancy features except aesthetics. L-shaped and U-shaped desks utilize space and offer more table room, but they’re bulky and harder to set up. Multi-tier desks offer more shelves and separate tiers for gaming equipment, while sitting/standing desks are more adjustable, expansive and ideal for ergonomics. Finally, foldable desks are good for limited spaces as you can fold and store them away when not in use. They’re also portable for gamers who love moving things around or frequent gaming arenas. The design you pick will be influenced by the kind of space you require, or your preferred gaming setup. Do you want a mount setup, will you use multiple monitors, or do you need a wireless or wired working area? Once you find the answers to these and other questions, you can make the last decision on the best design and location for your gaming rig. Similarly, the style of the desk affects your gaming efficiency. A well-designed desk with a lucrative style offers extra benefits over and above comfort and ergonomics. Your gaming equipment matters especially the weight. PC gamers would agree that the CPU tower alone weights quite a lot, so if you were to keep everything together with your monitor, peripherals and other gaming gear, the load capacity would matter. The right computer gaming desks are sturdy, and made from strong, long-lasting materials so you don’t end up with curves in the middle over long periods of gaming. This is important especially for PC tower users, so you can fit your gaming rig in a dedicated place that also allows it room to breathe without restricting cooling. You also avoid putting your gaming gear on the floor, especially where it’s carpeted. You also need ample space for your accessories and additional components like peripherals, streaming mic, and receivers/base stations for wireless devices. Your health is paramount especially if you’re a heavy gamer. Some people tend to do their office work along with their gaming setup, so the right desk and chair combo will ensure your body and posture are in perfect shape. The right desk also prevents the dreaded carpal tunnel syndrome, which is known to sideline many pro-gamers and office workers. Gamers value their time, which is why most gaming desk manufacturers try their best to reduce setting time by minimizing parts and improving manuals for office or home use. If you don’t like spending too much time assembling your desk, you can opt for a smaller size or something foldable. There’s a wide range in the possible costs of gaming desks. The more budget you have for one, the more features and benefits you can get for a thrilling gaming experience. 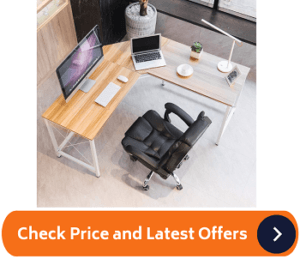 Realistically, it is possible to spend more if you want to, but once you know what you’re able to put down for a desk, you won’t need to look at more expensive options. 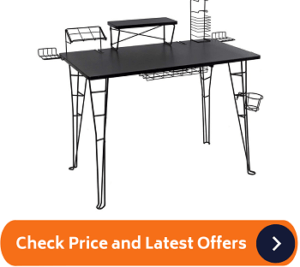 You’re better off with an affordable and plausible desk. For most gamers, shopping by brand may not seem too clever an idea, but most top brands excel in the things that matter most: comfort, durability, versatility, and much more. In short, they offer value for money, which is why they’re popular.